Ask Metro: What is a MetroLink Station Shuttle? Q: I’ve seen signs at MetroLink stations for a MetroLink Station Shuttle. What exactly is it? MetroLink Station Shuttles are used during planned and unplanned MetroLink service disruptions when trains are not able to operate on the MetroLink tracks. The bus shuttles transport MetroLink passengers between all stations affected by the service disruption. Shuttles are implemented during emergencies (for example, if a tree falls on the tracks during a thunderstorm) or during the rare occasions when MetroLink trains can’t operate on specific sections of the light rail system due to construction or track maintenance. 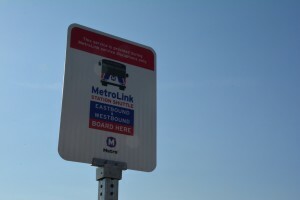 We’re currently in the process of installing signs that let you know where to board a MetroLink Station Shuttle during a service disruption. Take a look the next time you’re at a station so you know where you would need to board the shuttle. As mentioned in a previous Ask Metro, we make every attempt to schedule MetroLink maintenance work to minimize the impact on our customers. We implement MetroLink Station Shuttles only when absolutely necessary and operate them in a way to provide the least possible disruption to our riders. Can white people carry loaded SHOT GUNS on MetroLink? No. Metro’s policy is that NO firearms are allowed on its vehicles, property or facilities.